Approximately 3 inches. (wide) x 4 inches.(hight). 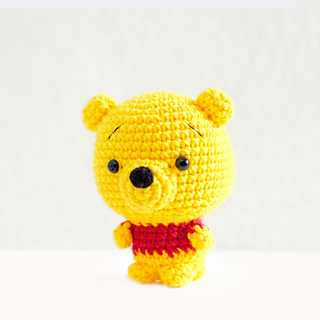 For Winnie the Pooh lovers!!!! • Size: Approximately 3 inches. (wide) x 4 inches.(hight). • Material: Cotton yarns 4 ply, black beads, embroidery thread, fiberfill stuffing, hook. Thank you for visited my shop!